Now in its tenth year and going stronger than ever, the Willow Park Whisky Festival is set to once again enlighten and entertain the lucky 800 who manage to get their hands on a ticket. Wednesday, November 3rd will see no less than sixteen leading industry figures, each with as many as four tables of different product lines, take over Willow Park Wines & Spirits for an evening of tasting, teaching and socializing. Last year’s festival saw an astounding 125 whiskies open and available for sampling. This year promises no less. Guests will receive a booklet of information upon arrival, listing whiskies and vendors, in order to plan their tour of the event. A wise approach which will help to ensure your tastebuds aren’t singed before you reach the gem or two you’ve been dying to sample. The Calgary Police Service Pipe Band will provide the soundtrack to an evening highlighted by the presence of Andrew Gray (Sales Director of Bruichladdich), Ronnie Cox (Director of Glenrothes and BBR) and Alex Bruce (Sales and Marketing Director of Adelphi), sharing their many years of experience and insight…not to mention whisky. Many other ambassadors will be circulating and available to answer questions. Past years at the festival have given us stunning and rare exclusive casks of Glenfiddich, from 1974 through 1977. All of which carry unique stories and histories, but share a couple of common attributes. First..all were limited to about 300 bottles. And second…each time the customer who came the furthest to claim his prize was from South Africa. This should help provide a little insight into the elite nature of such an event and such products. This years’s Willow Park exclusive barrel is a 1985 Glendronach. All assurances are that this is indeed a stunning cask. Certainly you’ll be able to form an opinion on the night of the festival. When it comes to getting the most out of the festival, Willow Park’s Whisky Buyer, afficionado and resident ambassador, David Michiels offers this bit of advice…”take it slow and do not rush the tasting”. Solid advice. 6:30 to 9:00 can make for a long evening when trying a few of the wares on display. One final note…please be safe. Taxis will be available. Please do not drink and drive. nothing been added or taken away. Price is £55 per bottle (not including any shipping). I hope you will agree that this is a good price and is exclusive to Forum members. Any remaining bottles will go on sale, towards the end of October, in the Chester Whisky Shop but at the full retail price of £69.99 (you will have to mention that you are a member of the Forum to get it at the original price). Shipping in the UK will cost roughly £7/bottle and Europe will be more like £10. Rest of the world will be closer to £20. No visit to Bowmore, or Islay for that matter, would be complete without a stop at Duffies Whisky Bar. Duffies is a part of the Lochside hotel on Shore Street just off the pier in Bowmore. The whisky bar is front and center when you enter, but the dining room toward the back offers a lovely view over Loch Indaal while you enjoy a rich and wonderful menu. The unimposing facade doesn't even hint at the treasures within. After finding the bar, I couldn’t help but put in an appearance three or four times on my recent trip to Islay. Much of the island’s tourism is focused on whisky, and what better way to sample a dram or three while on the island (aside from those offered on distillery tours) than making your way down Shore Street to Duffies? The bar stocks over 260 Islay malts alone, with selections from other distilleries available as well. The staff is friendly and frequently hilarious. One eve, while sipping an Ardbeg Renaissance near the bar, I overheard a gentleman ask the bartender what a certain coin in his hand was worth. Without hesitation the reply was, “that’s a two pound coin…we use those for tipping barmen”. Resounding laughs well deserved. I only hope that chap did indeed leave behind that coin. I shared a couple of great converstaions with the staff at Duffies. I only hope they can forgive me for not remembering them all by name. I’ll be back, folks. I’ll remember next time. I sat down with Duffie himself one afternoon to chat about his beautiful bar, exceptional selection and life on Islay. Duffie MacNeill is man for whom a smile comes naturally. His thick Scottish accent had me paying careful attention as we settled into a pair of armchairs for a chat, lest I miss any of the nuggets of humor he dropped. He and his wife Roberta have owned Duffies for 8 years now. Conveniently (and often inconveniently, I’m sure) they live just two doors down. I saw a fair bit of Duffie in the bar while in Bowmore, but he swears most eves he is not there if he can help it. I also briefly met his lovely wife, though she declined to join him in the photo op. Duffie himself mugging for the camera. In its present incarnation, Duffies is stunning. The bar boasts gorgeous woodwork on the shelving, as you can see below, where the malts of Islay are proudly and prominently displayed. All local timber, of course. And weighing down these shelves? Well…a brilliant collection of Port Ellen, broad ranges of Laphroaig and Bruichladdich, a nice selection of young Kilchoman releases, Black Bowmore for the high rollers and a locked glass case showcasing an Ardbeg 1965. 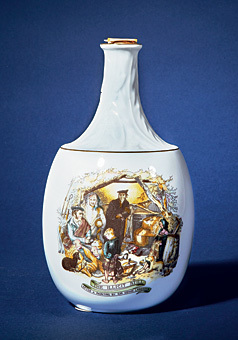 These are but a few of the offerings, many of which have slowly been migrated over from Duffie’s personal collection. The prices are more than fair. Your wallet may take a denting, but that will simply be from sampling many of the bottles, not because of Duffies’ pricing. A framed award on the wall from Whisky Magazine is almost redundant in confirming Duffies as one of the world’s premier whisky bars. One need only step inside to see for themselves. The place was fairly hopping each time I dropped in for a dram or a pint of Finlaggen ale, and there was always someone to chat with. I met an engaging chap from Hong Kong, a great couple from England and a few American folks. Duffie says the tourist trade is varied, with a large contingent of Japanese and Swedish visitors. Lots of Fins and Canadians as well. Surprisingly, not so many from the US. He says there is no longer a short tourist season anymore, instead a steady stream visit year round. I visited Islay in late September and can attest I met travelers from all over the globe. Just a part of Duffies' impressive collection. It is now mid-October. I have been home for nearly two weeks now. I can honestly say that Duffies is one of the places on Islay I am already missing. Looking forward to my next visit. Though we are officially a “Fine and Rare Wine” department we do, internationally, sell spirits from time to time. In London on October 21 and in New York on November 13, the Christie’s wine department will be offering selections of rare spirits for your bidding pleasure. Comparatively, spirits is a small percentage of what we do. That being said, when we stumble upon something truly rare or valuable (as I did last March) it is our great pleasure to offer it to spirits connoisseurs the world over. 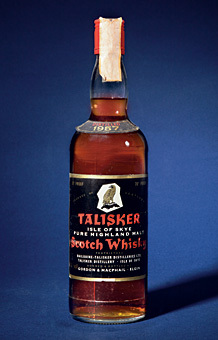 Usually, we specialize in rare bottlings of the finest Scotch, and vintage brandies, specifically Cognac and Armagnac. It was Scotch, however, that brought me to Italy…Italy can be surprisingly cold in March. We walked out of Milan Linate Airport to find the skies grey and as we drove towards our client’s home, the mists fell heavy by the roadsides. When we finally arrived, it was a relief to be ushered into the warmth within. The house was magnificent, a treasure trove filled with fine sculpture and modern art; it was clear that there was hard work ahead, but with this knowledge came a sense of anticipation. As soon as we were settled, our host was keen to focus our attention on a bookcase in the corner of the sitting room. Confused, we followed his lead, suddenly reminded that in this industry things are rarely quite as they seem. The bookcase slid back to expose a hidden metal door, six inches thick, and wrought from solid steel. A few deft workings around a combination lock and slowly, carefully, the door began to open, giving way to a sight that could make any whisky lover sob with joy. This was my second proper packing trip with the Wine Department, and my first dealing with whisky, but at that moment, it was clear that this was nothing short of astonishing. In this elegant, wood-panelled room stood almost two thousand bottles of whisky and other spirits, some of which dated back to first decades of the twentieth century. As I stood there, silent, staring up at row after row of dark bottles, I knew that this was something that would stay with me for quite some time. It was immediately apparent that the collector’s taste was impeccable and varied, allowing him, over a lifetime, to assemble a collection that was as broad as it was deep. What was also apparent was that we had been invited into someone’s private world; a microcosm where passion and connoisseurship met. Scotland and the great single malts were his first love. 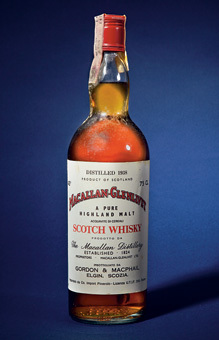 Looking along the meticulously ordered shelves, particular rarities stood out – The Macallan 1945, 1938 or 1946 – ancient whiskies that have endured, yet which are almost impossible to find today. As we moved around the room, checking, packing and moving boxes, we were taken on a journey across the moors of Scotland. From those Macallans of Speyside we move west towards the smoke-scented Islay malts: The Bowmore and wild, peaty Laphroaig. Morning gives way to afternoon, and we find ourselves reaching for highland malts and realise that we’ve covered most of the great distilleries of Scotland. As mentioned, this collector’s tastes were broad, and this helps to introduce his cache of Prohibition-Era American whiskies that we discovered, seemingly frozen in time. Amid all the Laphroaigs and the Tamnavulins we came upon this assortment of pint-sized bottles that could transpire to be the most significant collection of Prohibition Era whiskey to ever be sold at auction. The bottles were dusty and irregular in shape, unlike anything I’d seen before. Some date back to the years of the First World War – ‘Old Granddad Whiskey 1916 – Unexcelled – For Medical Use Only’ or ‘St George Reserve –Eighteen Summers Old’ – even their names seem redolent of a very different time. Eventually, we came to the end of our task and sat back, exhausted, looking around an empty room. With the excitement of packing such a superb ‘cellar’, came a faint feeling of melancholy as I looked around the bare rows – the next step would be finding these extraordinary whiskies an appropriate new home. This magnificent collection represents the largest single-owner collection of whisky that Christie’s have ever offered and an almost unheard of opportunity for the world’s greatest connoisseurs to access an exceptional testament to one man’s lifelong passion. Ahhh…home sweet home. I am still trying to catch up and get back into the swing of things, having returned from a week on Islay just days ago. Underslept and over-worked (yep…already). Apparently I spoke to my wife back home twice that night after our evening out. Ahem…a little slurred and overly-affectionate, as I am still being ribbed for. Oh well. Gotta confess, as well..I was a little worse for wear the next morning. Thanks, lads and lasses. Your warm welcome and hospitality was appreciated and shared with those back home. To the last two standing with me that night (you know who you are)…good luck with your new project. I’m sure it will be a huge success. Hopefully next time through Scotland I’ll be able to check it out. Ahem…one last thing…what does a guy have to do to get one of them snazzy shirts, huh? 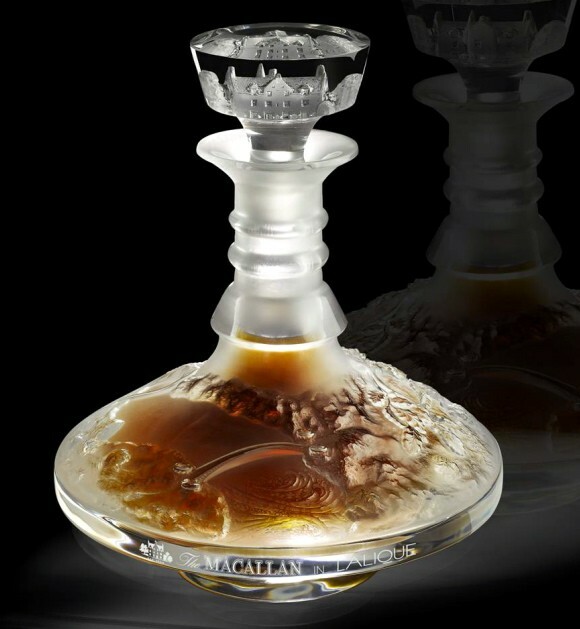 The world’s most expensive bottle of whisky, a one-of-a-kind crystal Lalique decanter holding the oldest and rarest Macallan single malt ever (above), will be auctioned off by Sotheby’s in New York on November 15 for an estimated $150,000 or more. The Macallan in Lalique Cire Perdue, which we previewed back in April, is filled with 64 years and older Macallan single malt Scotch, vatted together from three sherry seasoned Spanish oak casks. The famed Speyside distillery commissioned the legendary crystal artisan to create the decanter using the ancient “cire perdue” or “lost wax” method. Painstakingly hand crafted by Lalique exclusively for The Macallan, and inspired by the beauty of The Macallan’s 150 hectare estate in north-eastern Scotland, it’s based upon a ship’s decanter of the 1820s. Proceeds from the historic sale will be donated to charity: water, a non-profit organization bringing clean and safe drinking water to people in developing nations.